Activated carbon (AC) is widely used in the remediation of soil and groundwater. AC rapidly removes a variety of contaminants from both water and air, making it a powerful and reliable tool for remediation professionals. Structurally, AC is a highly porous material made up almost entirely of elemental carbon. 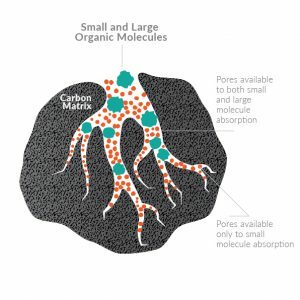 Due to its exceptionally high surface area and unique pore structure, small organic molecules are readily adsorbed from the target solution. The strength of adsorption onto AC depends on a variety of factors, but in general it correlates well with the water solubility of the molecule. 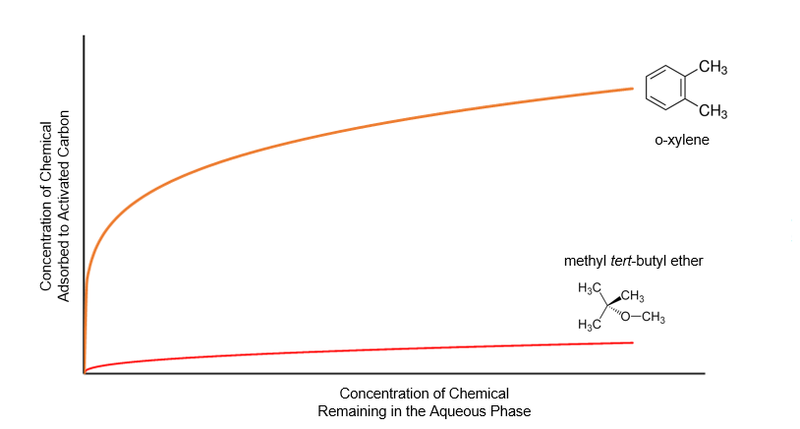 This means that large, poorly soluble compounds like Polyaromatic hydrocarbons (PAHs) will bind very strongly while smaller, more hydrophilic ones like MTBE will be loosely bound. The strength and efficiency of adsorption can be measured for a target contaminant, and this behavior can be modelled using adsorption isotherms. In practical terms, an adsorption isotherm is an important link between site contaminant concentrations and the correct dose of PetroFix or other AC-based treatments. While AC can be found in a wide range of physical forms according to its varied uses, there is typically an optimum AC form or particle size best-suited for each particular application. For in situ groundwater remediation applications, small-particle AC is preferred because its ability to transport effectively within an aquifer. The AC particles in PetroFix™ are 1-2 μm in size, which allows the product to freely flow in an aqueous suspension during low-pressure subsurface injections. Following application, the small particle size also ensures minimal soil pore space blockage, leaving groundwater flow undisturbed. Successful treatment of petroleum contaminants with PetroFix is a two-step process: immobilization followed and aided by biological destruction. The AC in PetroFix is responsible for the initial contaminant removal from groundwater. This often results in falling contaminant concentrations in a matter of days. After immobilization, the contaminants remain intact until degraded microbially by naturally occurring bacteria in the aquifer. A large number of scientific studies support this process, and the principle is successfully used in a combined biological- granulated activated carbon wastewater treatment process known as bio-GAC . When applied as recommended, PetroFix contains a blend of nitrate and sulfate salts that act as electron acceptors to stimulate and sustain enhanced biodegradation of petroleum hydrocarbons. Research has shown that petroleum hydrocarbons can be efficiently degraded in anaerobic environments by syntropic processes, or a community of bacteria playing different roles. While this process can be stimulated by the addition of common electron acceptors, contaminant degradation will continue once the electron acceptors have been exhausted. The recommended PetroFix electron acceptor blend contains nitrate, which should be used whenever possible. If nitrate is not permitted for use on your site, a nitrate-free blend of the PetroFix electron acceptor is also available. Question 1: Where is the contaminant mass and how is it distributed in soil, groundwater, or NAPL phases? Nearly all petroleum spill sites in which remediation is being considered must complete numerous investigative phases in order to understand the scope and magnitude of the problem. At most sites, the lateral extent of contaminants in the dissolved phase and the vadose zone is known to a satisfactory degree. However, it is also common that adequate, three-dimensional understandings of the distribution of contaminants in soil, groundwater, and NAPL phases (if present) are lacking. This is due in part to various regulations which are concerned with determining the nature and extent of contaminants for risk-screening purposes and not with its magnitude and distribution within these extents. This lack of information can cause contaminants to go untreated or for treatment to be applied to areas in which no contaminants are present. However, there are a number of tools in the environmental marketplace that can help close these problematic gaps. Of the various tools, a Membrane Interface Probe and Hydraulic Profiling Tool (MiHPT) is recommended to assess the distribution of contaminants in the subsurface and identify contaminant transport and storage zones. Additionally, Laser Induced Fluorescence (LIF) can be used to identify and delineate zones of NAPL in the subsurface. Question 2: How Much Contaminant Mass is Present? While the aforementioned tools are useful for determining distribution of contaminants and LNAPL they won’t provide a reliable estimate of contaminant mass on their own. Therefore, the information gained from these tools should be augmented with depth-discrete samples collected from saturated soil and groundwater. This makes it possible to compare readings from the MiHPT and LIF tools with the contaminant concentrations from laboratory analysis. The combined use of these methods can help develop a clearer picture of the contaminant mass distribution and the relative magnitude of contaminant mass within the affected soil. Question 3: What are the Treatment Objectives? In other words, what is needed to reasonably assure the project objectives can be attained? Is the use of PetroFix at this stage realistic for reaching the project goals? A clear understanding of the treatment goals should be understood by all project stakeholders including the site owner, purchaser or end user, the regulator assigned to the project and the consulting engineering firm’s project management/remediation design team. For instance, if the goals are drinking water standards but NAPL or other indicators suggest high mass is present at the site, mass removal technologies may need to be deployed prior to injection of PetroFix. Successful in situ remediation depends upon the effective aquifer distribution of the chosen amendment. In practice, this means proper coordination of the amendment mass, application volume, and aquifer accommodation volumes to achieve the desired cleanup. The soil particle size controls the amount of contaminant expected to be soil-bound. While both of these variables must be considered when designing an in situ remediation, the degree of interconnected pores is of greater interest in regards to application. The interconnected pore spaces present in soil are referred to as Effective Porosity. Typically, remedial designers are most interested in the aquifer’s effective porosity because it is this fraction in which groundwater can flow and remedial amendments can be applied with the greatest effectiveness. Successful PetroFix coverage is usually achieved when the total solution volume applied theoretically fills more than half of the effective porosity present. After determining the appropriate dose of PetroFix required to remediate the HC mass, the designer must consider the volume necessary to achieve at least a 50% fill of the effective pore space. This ensures that the remedial designer is delivering an appropriate mass of PetroFix to provide the necessary aquifer coverage. To properly dilute PetroFix the applier should use bottom emptying cylinder tanks with at least a 150 gallon capacity. The tank size should be based on the sites overall application volume and the anticipated rate of injection/acceptance. Use of totes or other square/rectangular mixing tanks are not recommended as these containers have dead spots that result in the uneven mixing of the PetroFix Solution. PetroFix is shipped as a viscous liquid approximately 1,500-3,500 centipose. This material has a viscosity that is similar to corn syrup. As a result, the applier should plan to use a chemical transfer pump that can move high viscosity materials. This is typically a double diaphragm equipped with hoses and a properly sized stinger/subassembly for removal of Petrofix from the shipped container. When transferring, it is beneficial to physically mark the container volume increments to better estimate the volume of PetroFix being moved from the shipping container to the mixing tank. Each gallon transferred weighs 9.8 lbs. REGENESIS recommends that PetroFix be injected into the subsurface under low pressure (<30 psi). Under low pressure, PetroFix will flow outward from the injection point through naturally occurring permeable strata (geologic layers). These “flux zones” of higher permeability are the same zones carrying the hydrocarbon contamination that appears in the monitoring well. As PetroFix moves through the flux zone it may intercept the monitoring well, temporarily turning the groundwater in the well grey or black. Generally, this is not a problem because the water will clear up as PetroFix flows down-gradient. If warranted, the monitoring well can easily be flushed clear of any PetroFix by simply following the REGENESIS Procedure for Flushing Impacted Monitoring Wells. When petroleum hydrocarbons such as fuels are released onto the ground surface from a spill or leaking tank, they migrate downward into the soil through a process of sorbing and draining through the soil pore structure. This results in a residual mass of hydrocarbon bound to the soils in what is referred to as “Residual Light Non-Aqueous Phase Liquid (LNAPL).” If the spill or leak is large enough in volume, the downward migrating hydrocarbons will impact the groundwater table surface and begin dissolving into the water, which is known as a “Dissolved Phase Plume.” If the spill or leak continues to impact the groundwater table the dissolved phase hydrocarbon concentrations may exceed the solubility point in water and form a “LNAPL Body or layer.” This layer is also referred to as “Free Product” floating on the groundwater surface. The presence of LNAPL on the groundwater surface can exist as a visual sheen or as a measurable thickness of petroleum floating upon the groundwater. There are a range of treatment technologies used to deal with these situations including active or passive skimming or bailing of the free phase release. When a sheen is present it is usually most efficient to pre-treat the area with a chemical oxidation technology prior to the use of PetroFix. Chemical oxidation technology, such as PersulfOx® or RegenOx®, will rapidly degrade a mass of residual LNAPL through chemical reactions. 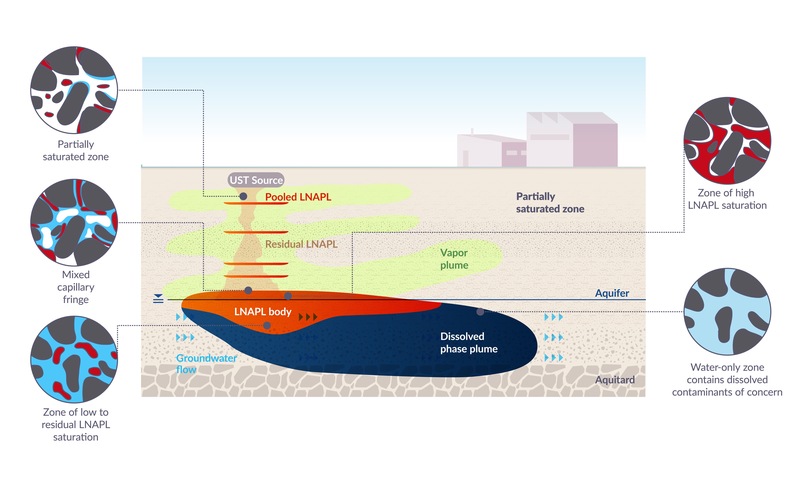 Once enough of the residual LNAPL mass is degraded, the PetroFix sorbs remaining dissolved phase hydrocarbons, completing the groundwater remediation process. For assistance in identifying an appropriate chemical oxidation technology and design guidance contact your local REGENESIS representative. In the event that a measurable layer of LNAPL above 6 inches is present on the groundwater table, it may be best to implement a “free product recovery” operation. This can be performed by a range of methods including periodic removal (e.g., vacuum trucks, sorbent wicks, or hand bailing), dual-pump hydrocarbon recovery systems, and dedicated multi-phase vacuum extraction systems. More information on LNAPL recovery can be found in a document published by the USEPA entitled “How to Effectively Recover Free Product at Leaking Underground Storage Tank Sites”.